Seriously, do they actually think this is another Earth? Has Nasa found a new Earth? Yeah, right. A habitable planet around a dwarf star, many of which are called "flare stars" because they are copious producers of coronal mass ejections and other star flares. That'd roast your putative ET's. And as if that wasn't enough, a terrestrial planet close enough to a dwarf star to be warm enough for liquid water is likely tidally locked to its sun, like the moon is to the Earth. The moon always shows us the same face, right? Well, imagine a planet who always shows the same face to the Sun. That side roasts, driving Jupiter-hurricane-force winds around to the permanently cold dark side, which might even be cold enough to precipitate out carbon dioxide as snow. Doesn't strike me as the land flowing with milk and honey. "Ever the pessimist, eh, Backwoods?" People smarter than me say there aren't any more Earthlike planets in this galaxy, and in fact, we may even be unique in the universe. Read Ward & Brownlee's book, the cover of which is pictured at right. 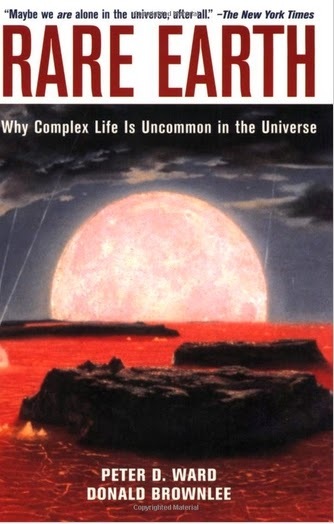 Their thesis is, complex life requires a planet very like the Earth, and statistically, there aren't very many planets like that, because there are too many factors that are required to line up just right. The marginally habitable planets can maybe support algae or bacteria, but nothing else. Yes, the Good Lord may have placed algae or bacterial life in other places in the universe, to please Him or accomplish His purposes. It is possible. But we will likely never know. Really? Yes, really, young Wesley Crusher, we'll likely never know, because we can't really travel faster than the speed of light. Moreover, the technology to travel even a few percent of c is completely beyond mankind in this era. And given our precipitous decline as a civilization, it is likely we will not develop it in this "cycle", either. Don't believe we're in decline? Look! The richest country in the world does not even have a manned space program anymore, after having landed on the moon more than 45 years ago. but instead has told its "space agency" to concentrate on Muslim outreach and warmal-colding. I do support science for its own sake, the joy of exploring the unknown. Science, in fact, has its roots in Christian men exploring creation to learn the mind of God. But the problem is, humanity has such overweening pride, that as soon as a planet is spotted around a flare star, people start dreaming of the Starship Enterprise and Vulcans. Get back to reality, people. You ain't that powerful, and you don't respect the One who is.